On rare occasions, a current event compels us to create a donut. Starting this Friday August 3, Psycho Donuts is PROUD to launch The Gay Bar! 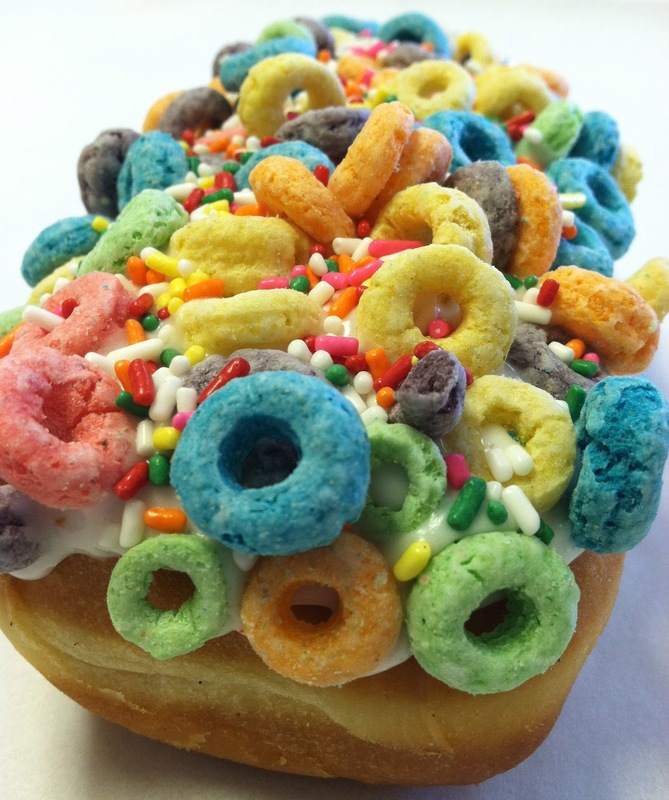 This diverse donut features Fruit Loops and Rainbow Sprinkles on a freshly-made bar-shaped raised donut. Sure, it's sweet - just like America. We live in the world's most diverse country, built on a brilliant foundation of freedom of speech, and freedom of belief. We're a country that embraces people of all color, race, and ethnicity. As a result, we attract some of the brightest minds in the world. The Psycho Moral System ("PMS") is our Crazy Code of Ethics which honors every person's right to choose their own beliefs. Do we respect Christian Family Values and the Biblical Marriage? You Betcha! We equally respect Jewish values, Muslim values, Morman values, and hundreds of other religious values - and let's not forget agnostic and athiest values too. We respect marriages based on love and respect. In the Bay Area, we routinely witness successful marriages of all forms, both heterosexual and homosexual. Children are exposed to just about everything in the San Francisco Bay Area, and yet, they are growing up to be fine and responsible adults (Psycho Donuts has only a little to do with this)! The "PMS" is based on tolerance, understanding, and an open-minded respect for humanity. The beauty of America is freedom of choice. For example, if you don't like Psycho Donuts, you have the choice of going to Happy Donuts down the street. Not everyone appreciates "The Psycho Sense of Humor" and satire/irony. We get that, and we're happy to live in a country that offers so many vast alternatives. Everyone can find the right donut shop that suits their own character and beliefs. Once you find the right donut shop for you, why not let others enjoy their choice too? In some countries, persecution and intolerance are mandatory. Thankfully, we live in a country where people can choose whether to be open- or closed-minded. We encourage our friends, families, employees, and fans to choose diversity and an open-minded belief system. Enjoy a Gay Bar, only at Psycho Donuts, for a limited time; starting this Friday, August 3, at both Psycho Donuts locations. Conan O'Brien, thanks for this great piece of work -you're a real piece of work!